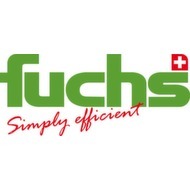 The plansifters of Fuchs Maschinen are suitable for control sifting of bigger but also smaller, not very sensitive bulk material. Mixomat drum blenders are used in the chemical, pharmaceutical and food industry for blending bulk materials. FUCHS Maschinen AG offers a new solution for the control sifting of bulk material: the CONTROMAT VE 450 and VE 630 in square shape with various sifting capacities between 0,15 m² and 0,3 m². Up to now, the CONTROMAT used to be delivered without outlet for foreign particles. Suitable for 0.5 to 2 litres containers, for bulk materials with max. bulk weight 2kg/l, control unit with digital timer, two lines display for set and remaining blending time, adjustable from 1 s to 999 h, speed regulation from 0 to 47 rpm. The GRANOMAT JP disk mill is designed for the ultrafine grinding of numerous products. Flexible milling solutions thanks to variable disk configuration: Fuchs' Granomat JP is designed for the ultrafine grinding of numerous products with both wet and dry milling.